Cindy S. submitted this photo and caption. 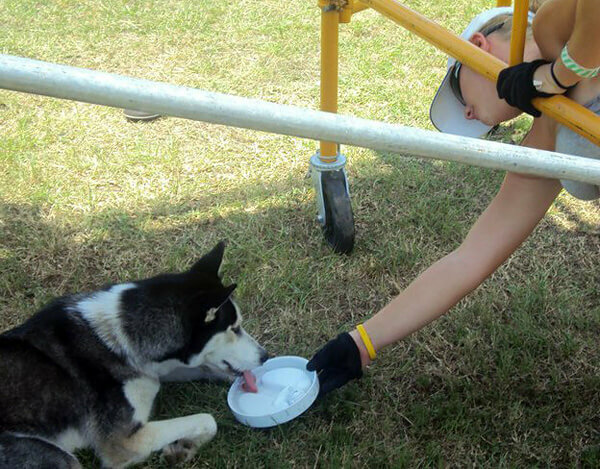 The Troopers were rehearsing in Mississippi before the show, and during horn arc, sectionals and ensemble rehearsal, there was a dog that kept coming onto the field. The staff would continually chase it off, only to have the dog come back again. Eventually the dog settled in under the scaffolding for the rest of rehearsal. Right before ensemble, I noticed it was panting, so I poured some water so she could drink.